Five years ago today, a Kevin Pietersen-led England played against a team called the "Stanford Superstars," which was made up of West Indian cricketers in a Twenty20 match in which the winners would pocket $20 million. The extravaganza was funded by Allen Stanford, a multi-millionaire who lived in the Caribbean. The match was intended to be the first of five—one played annually—but when Stanford was arrested for fraud and sentenced to 110 years in prison, the ECB terminated their contract with the financier and the tournament was consigned to the annals of history. Five years on from one of the most embarrassing sagas in English cricket history, B/R takes a look back at the whole gruesome escapade. The ECB were keen to enter in a deal with Stanford to help find a solution to the growing problem of the Indian Premier League. The T20 league in India offered English players unparalleled riches, and the ECB were concerned about losing control of their players during the six-week tournament that clashed with the beginning of the English season. The Stanford Super Series therefore posed a handy alternative that offered England's players the opportunity to earn significant sums of money in an ECB-endorsed tournament that could be played at a time in the calendar in which there were few schedule clashes. In light of what happened later, with Stanford's arrest, his gratuitous welcome onto the Nursery Ground with his helicopter at Lord's, the Home of Cricket, was cringeworthy and embarrassing. Flanked by ECB chairman Giles Clarke and West Indian cricket legend Sir Gary Sobers, Stanford prowled around the Lord's Nursery Ground. He had been involved in West Indian cricket before the launch of the Stanford Super Series—running the domestic T20 tournament in the Caribbean and putting together a group of "legends" to endorse his project. West Indian cricket has a rich heritage. The fact that legends such as Sobers and Sir Viv Richards were drawn into the whole facade is a huge shame. Perhaps the most enduring image of the saga will be Stanford flanked by cricketing head-honchos and former players, standing tall, and beaming behind a glass box of $20 million. Whether the money was even real is unknown, in the light of the fraud scandal, but it was a grotesque show of wealth and power. Of all the short-form matches currently being organised, the conclusion is easily reached that Stanford Superstars v England is the most offensive. It has no context as a proper sporting competition, it is neither country versus country, club versus club or invitation XI versus invitation XI. It is a rococo hybrid. It has money but nothing else going for it. When the series eventually got underway, the walking, talking disaster continued. The pitches were poor, the cricket was shoddy and the show was horribly stage-managed. Cricket was Stanford's toy and he was enjoying playing with it. Perhaps the most embarrassing moment of the tournament was when Emily Prior—wife of England wicket keeper Matt Prior—was seen bouncing on the knee of Stanford. who looked like the cat who had got the cream. To top the whole thing off, England lost the $20 million match, thus taking home nothing and rendering the initial point of getting involved unfulfilled. It wasn't even a close match, with the Stanford Superstars romping home by 10 wickets. England looked disenchanted, fed up and wholly unimpressed with the occasion. And who could blame them? The Stanford Saga should be remembered as one of the most embarrassing moments in cricket history, and an accurate reflection of an era dictated to by money and greed. Receiver files 5th Schedule of Payments to be Made Pursuant to the Interim Distribution Plan - On October 25, 2013, the Receiver filed his 5th Schedule of distribution payments with the United States District Court for the Northern District of Texas, Dallas Division. The 5th Schedule will be followed by others, each of which will be submitted by the Receiver on a rolling basis as additional responses to Certification Notices are received and processed. To view a copy of the 5th. Schedule, please click here. And what happened with the IRS? What is built with lies and evil intention will collapse sooner or later. Receiver files 4th Schedule of Payments to be Made Pursuant to the Interim Distribution Plan - On October 17, 2013, the Receiver filed his 4th Schedule of distribution payments with the United States District Court for the Northern District of Texas, Dallas Division. The 4th Schedule will be followed by others, each of which will be submitted by the Receiver on a rolling basis as additional responses to Certification Notices are received and processed. To view a copy of the 4th. Schedule, please click here. The Securities Investor Protection Corp., an industry fund that covers losses from brokerage firm failures, must compensate victims of Allen Stanford’s $7 billion Ponzi scheme because they were customers of a U.S.-based brokerage, a government lawyer told an appeals court. The SEC is seeking to overturn a lower court ruling that blocked the agency from ordering SIPC to cover the Stanford victims, who invested in phony certificates of deposit. U.S. District Judge Robert Wilkins in July 2012 ruled the SEC had failed to show the 7,000 investors in the scheme met the definition of “customer” under the Securities Investor Protection Act, which set up the nonprofit fund run by the brokerage industry. The Stanford case is the first time the SEC has gone to court to force SIPC to extend coverage. Michael McConnell, an attorney for SIPC, urged the judges to uphold the ruling. In Stanford’s swindle, his brokerage clients were directed to buy the CDs at his Antigua-based Stanford International Bank LLC, which was not a SIPC member, McConnell said. “There was no deposit of money with SGC in this case” and thus no basis for extending coverage to its clients, McConnell told circuit judges Merrick Garland and Sri Srinivasan. A third judge, David Sentelle, was absent and will listen to a recording of arguments. Much of the hour-and-20-minute hearing was consumed by debate over the legal definition of “customer” and whether the SEC has authority to force SIPC to amend its rules to broaden the meaning to include victims when a collapse involves both member and non-member companies. Stanford was convicted of multiple counts of wire fraud, mail fraud and other charges in March 2012 and was sentenced to 110 years in prison. SIPC, a congressionally chartered corporation, oversees liquidation of failed brokerages and through an industry-financed fund may also pay claims of as much as $500,000 a client for missing money and securities. SIPC agreed to pay victims of Bernard Madoff’s Ponzi scheme, in which $17 billion of principal disappeared according to the U.S., as well as investors who lost money in the collapse of Lehman Brothers in September 2008 and the MF Global Holdings Inc. commodities brokerage in October 2011. The SEC argued that the denial of coverage didn’t consider the relationship between Stanford’s bank and brokerage. “It’s very difficult to draw and distinction, a meaningful distinction, between any of these Stanford entities,” Avery said in court. Money spent on the CDs from the Antiguan bank came back to Stanford-controlled entities in the U.S., he said. “This was a Ponzi scheme based in the United States,” he said. The SIPC fund contains about $1.9 billion and exposure from Stanford victims is “potentially in the billions,” Dan McGinn, a spokesman for SIPC, said in an interview last week. “The SEC’s proposed expansion of SIPC protection, absent even the most rudimentary consideration of any financial consequences, would radically transform the SIPA and threaten SIPC’s ability to function as Congress intended,” they wrote. “Legislation is the better way to go rather than to try to extend SIPC coverage retroactively,” Coffee, who has no involvement with the case, said in a telephone interview. The case is Securities and Exchange Commission v. Securities Investor Protection Corp., 12-5286, U.S. Court of Appeals, District of Columbia (Washington). WASHINGTON, Oct 16 (Reuters) - U.S. regulators sought to overturn a 2012 court ruling that prohibited victims of Allen Stanford's $7 billion Ponzi scheme from seeking compensation, in an unprecedented legal battle between the government and an industry-backed fund that protects investors. In oral arguments on Wednesday, a lawyer for the U.S. Securities and Exchange Commission urged the U.S. Court of Appeals for the District of Columbia to force the fund to start court proceedings so that victims can file claims to recover at least a portion of the millions of dollars they lost. The Securities Investor Protection Corp (SIPC), which administers the fund, has refused to do so, saying it believes Stanford investors do not meet the legal definition of "customer" under a federal law that is designed to protect investors if their U.S. brokerage collapses. SIPC uses funds paid for by the brokerage industry to compensate investors if that happens. A federal district judge agreed with SIPC's position in July 2012, and tossed out the SEC's lawsuit. But pressure from a well-organized group of investors who lost money in the scheme and some members of Congress has helped keep the fight alive. Two of the judges on the panel put lawyers representing the SEC and SIPC through a series of rigorous and difficult questions, often playing devil's advocate with each side. A third judge on the panel was not present for the arguments. The judges gave no strong hints on how they may rule. However, Chief Judge Merrick Garland asked a series of questions about whether the SEC could simply write new rules that would compel SIPC to act, as opposed to seeking a resolution in court. The SEC, as SIPC's regulatory supervisor, has argued that it has the legal authority and discretion to force the fund to take action. "Is there anything stopping the SEC from issuing a rule defining 'customer' the way that you want to define it here?" Garland asked. "I don't believe so," replied John Avery, the attorney arguing the SEC's case. But if it were challenged, he added, the SEC would land right back in court again. Allen Stanford was sentenced in 2012 to 110 years in prison for bilking investors with fraudulent certificates of deposit issued by Stanford International Bank, his bank in Antigua. Many of the investors who purchased these products, however, did so through his Houston, Texas-based brokerage, Stanford Group Co.
At the heart of the case is the question of whether the victims of Allen Stanford's Ponzi scheme meet the legal definition of "customer." SIPC argues that the investors in the scheme entrusted their money to the offshore, unregulated Antiguan bank and not to the U.S. broker-dealer. Moreover, they say that Stanford's investors actually did receive their certificates of deposit as promised, even though they turned out to be virtually worthless. The law, they said, is not designed to combat fraud or guarantee an investment's value. The SEC, however, says the location of the Stanford bank is irrelevant because the entire business organization was operating one massive fraud, and that in fact no actual certificates of deposit truly existed. "It's very difficult to draw a meaningful distinction between any of these Stanford entities, which were all part of the scheme, they were all in on the scheme, they didn't follow corporate formalities and the money was commingled," SEC attorney John Avery argued. "We believe the money, at least constructively, stayed with SGC." SIPC's attorney Michael McConnell urged the court not to allow the SEC to simply lump the Stanford business entities together so the investors can file claims. He added that the investors received disclosures explicitly telling them the Antiguan bank was not SIPC-protected or U.S.-regulated. "You have people who in the face of disclosure statements clearly to the contrary, go off to an offshore bank seeking ... outlandishly high rates of return knowing that it is not covered by the securities laws," he said. "Effectively, what the SEC is telling us is that SIPC should implicitly give free insurance coverage to a fly-by-night organization." President Barack Obama received $4,600 in campaign contributions from R. Allen Stanford less than a year before the Texan was arrested in 2009 for running one of the biggest Ponzi schemes in U.S. history. Despite repeated requests, the Obama campaign has not returned the money to the court-appointed receiver tasked with recovering money from the fraud and returning it to Stanford’s victims. The campaign still has $5.4 million in its coffers even though the president won't be running in another election. Obama isn’t the only politician who has declined to return Stanford campaign contributions to help make Stanford’s defrauded investors whole. A total of 39 candidates and committees have kept their campaign funds despite the pleas by the receiver, Texas Lawyer Ralph Janvey, to return the money. A spokesman for the Democratic National Committee, which now speaks for the Obama campaign, did not immediately comment. Rep. Pete Sessions, R-Texas, has the largest outstanding contribution that hasn’t been returned — $10,000 — according to the web site of the receiver. The New Jersey Democratic State Committee also received $10,000 from Stanford and his companies, the web site says. Other members of Congress on the receiver’s list include Sen. John Cornyn, R-Texas, and Rep. Richard Neal, D-Mass. Stanford was sentenced in 2012 to 110 years in prison for bilking investors out of $7.2 billion. The Texan ran an investment firm that sold fraudulent certificates of deposit in an Antigua-based bank that he owned called Stanford International Bank Ltd.
Five Democratic and Republican national campaign committees, which had received more than $1.6 million from Stanford and his companies, fought attempts by Janvey to recover those contributions. In October 2012, a federal appeals court ordered the committees to turn over the money and pay the receivership’s attorney fees. Janvey has not sued Obama’s campaign, or the other 38 committees who haven’t returned their contributions, because the cost of a suit would be more than the amount recovered, said Kevin Sadler, a lawyer with Baker Botts that represents the receivership. Many members of Congress and presidential candidates returned the ill-gotten contributions voluntarily. Former Sen. Christopher Dodd (D-Conn.) returned a total of $27,500 and Sen. Richard Shelby, R-Ala., reimbursed the receivership $14,000. Janvey was appointed in February 2009 to wind down Stanford’s web of companies and try to recover as much money as possible to return to the investors who were defrauded in the scheme. To date, he has recovered $234.4 million. However, the costs of winding down the companies, and of lawsuits trying to recover money, have eaten up more than half that amount. Stanford investors last month began receiving their first checks since the receivership was created in amounts that totaled about a penny for each dollar lost. Updated, 7:27 p.m. | The trustee seeking to recover money for the victims of Bernard L. Madoff’s Ponzi scheme asked the Supreme Court on Wednesday to review a ruling that prohibits him from suing several of the world’s largest banks that he contends aided the fraud. In June, a federal appeals court in Manhattan decided that the trustee, Irving H. Picard, did not have standing to sue JPMorgan Chase, UBS, HSBC and UniCredit Bank Austria on claims that they abetted the multibillion-dollar fraud, which lasted decades. That opinion upheld a lower-court ruling by Judge Jed S. Rakoff of Federal District Court in Manhattan. On Wednesday, lawyers for Mr. Picard filed a petition to the Supreme Court requesting that it hear an appeal of the case. In a statement, the lawyers for the trustee said the ruling by the United States Court of Appeals for the Second Circuit contradicted the decisions of other appeals courts across the country. Such conflicts often provide an impetus for the Supreme Court to hear a case, though it accepts only a fraction of appeal requests. The court receives about 10,000 petitions for a so-called writ of certiorari each year, yet grants only about 75 to 80 of those cases, according to its Web site. The legal issue in the Madoff case centers on whether the trustee has the right to pursue claims against a third party, like a bank, that collaborates with a broker — in this case Mr. Madoff — to defraud customers. The appeals court ruled that under the law, the trustee “stands in the shoes” of Mr. Madoff’s firm and thus cannot sue the banks for losses caused by Mr. Madoff’s fraud. Mr. Picard’s lawyers said the appeals court ruling undermined the intent of the Securities Investor Protection Act. Mr. Picard is trying to recover billions of dollars from the banks that he said turned blind eyes to clear warning signs of the Madoff fraud. He contends, for instance, that JPMorgan was “thoroughly complicit” in the fraud, having obtained many indications of misconduct and failed to report the suspicious activity. Federal prosecutors continue to investigate whether JPMorgan failed to properly alert regulators about Mr. Madoff’s business, said people briefed on the investigation. A JPMorgan spokesman declined to comment. Cash losses from the fraud are estimated at about $17 billion, but the paper wealth that was wiped out totaled more than $64 billion. Mr. Picard has thus far recovered about $9.4 billion and continues to pursue lost money. Mr. Madoff is serving a 150-year sentence in a federal prison in North Carolina after pleading guilty in March 2009. While the trustee’s lawyers at Baker Hostetler try to pursue a case against JPMorgan, they have another legal connection to the banking giant. Mr. Rivkin and Oren J. Warshavsky are representing Bruno Iksil, the JPMorgan trader nicknamed the London Whale, who is cooperating with the government in its investigation into the bank’s record trading loss. In addition, jury selection for the first criminal trial related to the Madoff case is under way in federal court in Manhattan. Five former employees of Mr. Madoff, including his longtime personal secretary and two computer programmers, are fighting charges that they helped their boss carry out his fraud. The trial is expected to take as long as five months. Another Miami judge on Friday sentenced court receiver and bankruptcy trustee Marika Tolz, after which she reported to authorities to begin serving her time. Miami-Dade Circuit Judge Matthew Destry on Friday sentenced Tolz to 81 months – the same sentence she received in her federal case – to be served at the same time as the federal sentence. Tolz spent years as a trusted fiduciary for the federal and state court systems, but was hit with federal charges in March for misappropriating $16 million and pocketing about $2.4 million. In July, she became the second receiver in South Florida to be imprisoned for fraud in a year. In 2010, receiver Lewis Freeman was sentenced to eight years and four months for using his position to misappropriate almost $7 million over 11 years, pocketing about $2.6 million. Tolz’s state case mirrored the federal charges, but revolved around a more specific set of circumstances, where Tolz misappropriated money from the estate of a deceased man, James Christensen, which she was supposed to be overseeing. Destry also ordered her to repay $550,000 missing from that account and $200,000 for attorneys fees from the case. She was previously ordered to repay all the missing funds as part of her federal sentence. Tolz’s attorney, Benedict P. Kuehne, said she reported to authorities after the state sentence was handed down late Friday afternoon. Tolz and Kuehne have said that she began dipping into accounts when her mother fell ill years ago. Investors fleeced of $6 billion by now-imprisoned swindler R. Allen Stanford have gotten restitution checks from a court-appointed receiver. They range from $2.18 to $110,000, amounting to less than a penny of recovery for each dollar lost, reports the Center for Public Integrity. The receiver, Ralph Janvey, and his team recovered $234.9 million from Stanford's bankrupt company and charged about $124 million for doing so. When 18,000 people got fleeced in Allen Stanford’s $7.2 billion Ponzi scheme, the court appointed a receiver in 2009 to recover as much money as possible from Stanford’s failed companies to return to investors. After four-and-a-half years, the receiver, Ralph Janvey, began mailing checks ranging from $2.81 to $110,000 to hundreds of investors. That amounts to about $55 million of the $6 billion lost in the scheme, less than a penny on the dollar. Unlike the investors, Janvey, who has billed from $340 to $400 an hour for his services, is making out quite well. To date, Janvey and his team have recovered $234.9 million from the bankrupt Stanford Financial Group and spent more than half the total — approximately $124 million — on personnel and other expenses. The largest chunk of the Janvey team’s expenses — $67.1 million — was spent on “receivership’s professional fees and expenses,” according to court documents. Those fees and expenses add up to more than 28.5 percent of the money recovered from Stanford’s assets so far. Janvey has “complete and exclusive control, possession, and custody” of the assets left behind by Stanford’s business, according to the court order that named him receiver on Feb. 17, 2009. Janvey’s attorney, Kevin Sadler of Houston law firm Baker Botts, said the high costs are an unfortunate downside of unwinding Allen Stanford’s 18-year financial house of cards, which had offices in 23 states and 13 countries and more than 3,000 employees. Sadler said Janvey has been fighting a “worldwide tug of war over what was left of Stanford’s assets,” involving multiple national governments and liquidators in Antigua where Stanford International Bank was located. In March, Janvey reached a settlement to recover about $300 million worth of Stanford’s assets that have been frozen in Switzerland, Canada and the United Kingdom. Sadler said such lawsuits are now the best hope for getting more money back for Stanford’s victims. Janvey has been enmeshed in controversy regarding the Stanford liquidation. The Securities and Exchange Commission, which nominated Janvey and rarely has public disputes with receivers, won a motion to rein in some of his spending in June 2009 after the first fee applications were submitted. A large part of the receivership’s early spending — $48 million — went to winding down the more than 100 companies in the Stanford Group, costs that were unavoidable, Sadler says. Today, Little says Janvey’s spending has slowed. In the 12 months ended June 30, he’s spent $9.1 million, compared to $20 million spent in the first two months of the receivership in 2009. When large Ponzi schemes or companies go bankrupt, court-appointed receivers often find themselves employed for long stretches of time with a guaranteed income. There are no clear rules or guidelines dictating how a receiver should go about unwinding a failed or fraudulent business or recovering its assets, Sadler said. 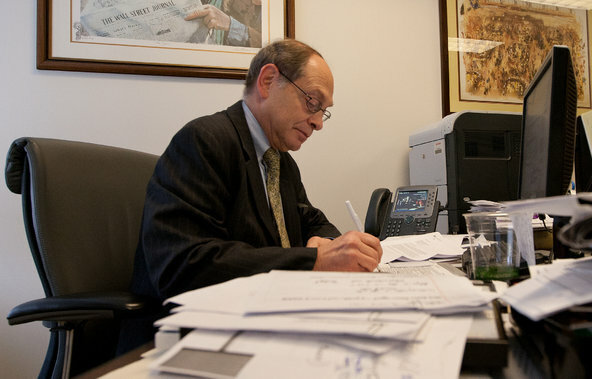 That allows receivers like Janvey to work full-time for years on an estate, billing either investors or the congressionally chartered Securities Investor Protection Corp. (SIPC). Allen Stanford’s $7 billion scam was just one of many Ponzi schemes to fall apart within the past five years. Most notably, Bernard Madoff was sentenced to 150 years in prison for operating a $50 billion Ponzi scheme that cost investors more than $17 billion. Irving Picard, the Madoff receiver who was appointed in December 2008, says he has spent about $850 million trying to recover money for investors. The number is huge but it’s less than 10 percent of the $9.5 billion he’s returned to Madoff’s victims. He’s distributed $4.9 billion. He declined to say whether he believes Janvey’s costs are too high. “I don’t know enough about the specifics about what he had to do,” Picard said in an interview. Picard has also sued hundreds of people and is working in more than 20 countries to recover money. Sadler said Madoff’s scheme was a “compact operation to wind down” in comparison to Stanford’s, which involved more than 100 different interconnected companies. Like Picard, he said, Janvey watches his costs. “We’ve been pretty sensitive to the fact that we can’t spend $10 to recover $10 — or even $5,” he said. Janvey has sued about 1,800 former Stanford employees and customers whom he says got money from the company — either in salary, bonuses or investment returns — that rightfully belongs to the defrauded investors. “Everyone we have sued, we have sued because in both fact and law we believe they received money they were not entitled to,” Sadler said. He said the total amount Janvey could recover from these lawsuits is $1 billion, the only remaining source of money for the defrauded investors. Most of the former employees and clients are fighting the suits because they believe they only got money they were entitled to. Such lawsuits are now the best hope for getting more money back for Stanford’s victims, he said. Susan Jurica was a fixed-income portfolio manager at the company. In 2008, about a year before the SEC shut down the company, her entire team was let go. Jurica took a lump sum severance of $50,000 rather than opt for monthly payments. When Janvey took over, she says, he looked for any person who got a payment of $50,000 or more and went after the money on behalf of investors. At the heart of the fraud were certificates of deposit that were sold to victims, which Jurica says she did not profit from. 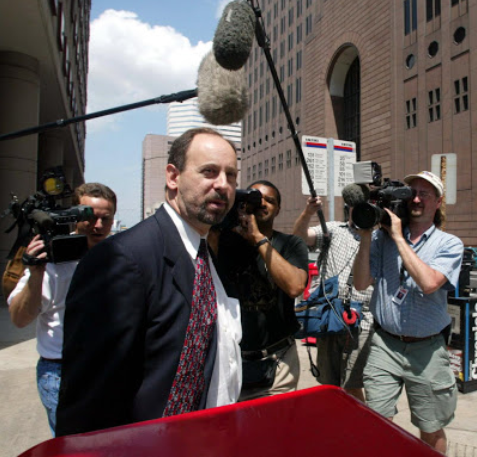 Jurica is still fighting the lawsuit in a Texas court. 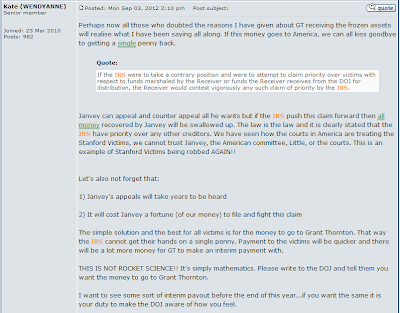 Janvey has sued thousands of people but he has forgone many lawsuits because the return wasn’t worth it. 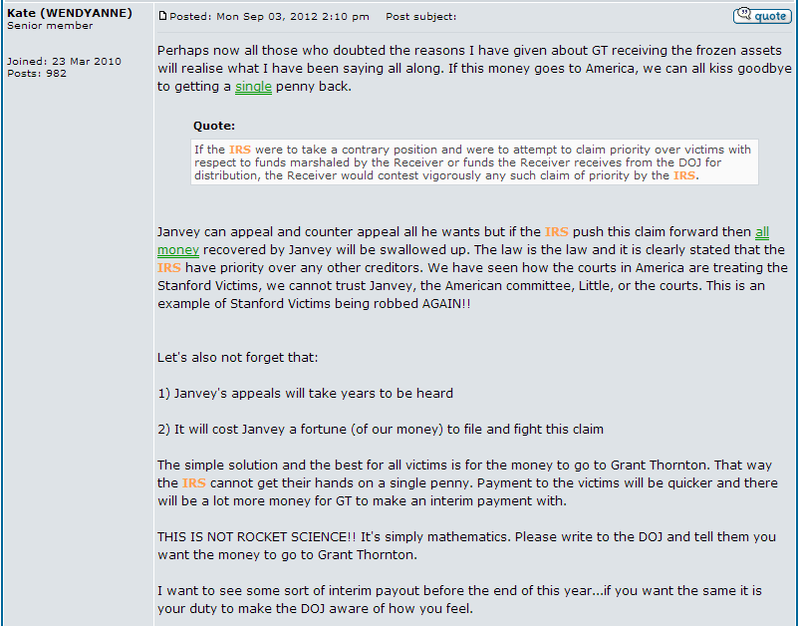 For example, Janvey sued the Democratic and Republican national party committees to recover Stanford’s contributions. He also sent letters to the more than 50 senators and House members who received Stanford contributions but did not go to court. Fewer than 20 returned the money, he said. Picard’s fees are not taken directly out of the estate, but are paid off by the SIPC at a 10 percent discount off his usual rate. Janvey, on the other hand, is paid directly by the estate at a 20 percent discount because the Stanford case was turned down by the SIPC. The SEC sued SIPC over the decision not to protect Stanford investors, but lost. It will appeal that decision this fall. The SIPC said it does not cover the Stanford investors because the Securities Investor Protection Act “does not authorize SIPC to protect monies invested with offshore banks or other firms that are not SIPC members. The Act also does not protect investors against a loss in value of a security, including because of mismanagement or fraud,” according to its website. Another receivership backed by SIPC was the Lehman Brothers Holdings Inc. bankruptcy. The expenses billed by the receiver in that case, James W. Giddens, including administrative, professional, consulting and operational costs total more than $1.8 billion since the filing date in 2008, according to court documents. The returns have been big. “Customer distributions will exceed $105 billion, by far the largest customer distribution in history,” Giddens’ ninth interim report states. Janvey has been widely criticized for spending too much, but Sadler insists it’s the only way to resolve a major fraud. “When these things collapse, they just cost a lot of money to clean up,” he said. Meanwhile, Stanford’s investors are still waiting. John Wade of Covington, La., was looking to sell his business and retire when he started doing business with Stanford. The veterinarian and his partner decided to invest $2.5 million in pension funds and personal savings with a Stanford Financial Group financial advisor as they prepared to put their business, which provides microchip IDs for pets, on the block. WASHINGTON—A case brought by victims of R. Allen Stanford's $7 billion Ponzi scheme posed a quandary for Supreme Court justices, in part because the Securities and Exchange Commission argued that siding with the victims would hamstring federal oversight of the stock markets. The plaintiffs want to sue law and financial firms that worked with Stanford Investment Bank, alleging they aided Mr. Stanford's scheme. In 2006, the justices held that federal law blocks class-action lawsuits over fraud related to securities sales if those sales fell under the regulatory authority of the SEC. In order to maintain broad authority over the markets, the SEC has argued for an expansive reading of its jurisdiction, which the court has held includes misrepresentations "in connection with the purchase or sale of a covered security." That legal position made the SEC a strange bedfellow of companies that worked with Mr. Stanford's operation, including SEI Investments Co. SEIC -1.88% and Willis Group Holdings, WSH -1.14% and the law firms Proskauer Rose LLP and Chadbourne & Parke LLP. These firms, which deny wrongdoing, are seeking to have the victims' lawsuit dismissed under the 1998 Securities Litigation Uniform Standards Act, which bars class-action claims filed under state law. The Ponzi scheme worked by selling investors fixed-rate certificates of deposit in Mr. Stanford's Antigua-based bank. Investors were falsely told that the certificates were backed by safe, liquid investments in the stock market. In fact, the fraud depended on using funds from new investors to pay off earlier ones who withdrew their money. On Monday, the first day of the Supreme Court's 2013-14 term, a lawyer representing the defendants, Paul Clement, told the justices that the Stanford CDs were, in effect, sold as a vehicle by which to reap returns from stocks. The lawsuit was therefore barred under the high court's precedents, he said. If Mr. Stanford falsely promised to purchase covered securities for the benefit of the plaintiffs, Mr. Clement said, then that would meet the standard for SEC jurisdiction, namely that the fraud happened "in connection with" a security sale. But several justices suggested they were worried about adopting a definition that was too broad. Justice Elena Kagan offered an example of a prenuptial agreement in which one spouse promised to sell Google Inc. GOOG -1.39% stock to buy a home. "Is that covered by the securities laws now?" she asked. Elaine Goldenberg, representing the government, told the court that the SEC's jurisdiction was triggered by frauds that diminish investor confidence, something essential for the stock markets to operate. Justice Anthony Kennedy suggested that many actions might diminish investor confidence without properly triggering an SEC investigation. "If you went to church and heard a sermon that there are lots of people that are evil, maybe then you wouldn't invest," he said. A lawyer for the plaintiffs, Thomas Goldstein, argued that the Stanford fraud wasn't "in connection with" the sale of securities because the victims weren't the ones who would have bought the fictitious shares. But some justices suggested that such a rule could effectively immunize some frauds from SEC enforcement. "If someone tells me…'Give me the money, I will buy securities for myself and give you a fixed rate of return later,' I think that's 'in connection with' the purchase and sale of securities even though it's not legally purchased for my benefit," said Justice Sonia Sotomayor. A decision is expected before July. WASHINGTON (Reuters) - On the first day of its new term on Monday, the U.S. Supreme Court appeared divided over whether lawyers, insurance brokers and others who worked with convicted swindler Allen Stanford could avoid lawsuits by investors seeking to recoup losses incurred in his $7 billion (4.3 billion pounds) Ponzi scheme. New York-based law firms Chadbourne & Parke and Proskauer Rose and insurance brokerage Willis Group Holdings Plc were all sued by former Stanford investors. They are part of a consolidated case along with two other defendants, financial services firm SEI Investments and insurance company Bowen, Miclette & Brittin, for which the Supreme Court heard a one-hour argument on Monday. The defendants sought Supreme Court review after the New Orleans-based 5th U.S. Circuit Court of Appeals in March 2012 said the lawsuits brought under state laws by the former Stanford clients could go ahead. The former Stanford clients are keen to pursue state law claims because the Supreme Court has previously held that similar so-called "aiding and abetting" claims cannot be made under federal law. The defendants have argued that under the Securities Litigation Uniform Standards Act (SLUSA), the claims cannot be heard under state law either. The class action lawsuits filed by the former investors accused Thomas Sjoblom, a lawyer who worked at both law firms, of obstructing a Securities and Exchange Commission probe into Stanford, and sought to hold the other defendants responsible as well. Stanford's fraud involved the sale of certificates of deposit by his Antigua-based Stanford International Bank. Much of the litigation centres on whether these qualified as securities under applicable laws. Stanford is serving a 110-year prison sentence. During Monday's oral argument, the justices questioned to what extent a ruling in favour of the plaintiffs would affect the SEC. The Obama administration, representing the SEC, sided with the defendants. The administration said in court papers it was against the lawsuits because they would conflict with Congress's intent to give the SEC the "ability to protect the securities markets against a variety of different forms of fraud." Justice Department lawyer Elaine Goldenberg told the justices that lawsuits like those filed by the Stanford investors have "a very particular effect on investor confidence and the integrity of the markets, which is one of the purposes of the securities laws." Several justices, including Justice Elena Kagan and Justice Stephen Breyer, indicated they would be uncomfortable with allowing such lawsuits to proceed in state court, although they also seemed keen for some kind of limit to federal authority. Justice Anthony Kennedy, often the swing vote in close cases, questioned whether the claims made by the Stanford investors were any different from similar cases that courts already have determined to be excluded from state law claims. But Justice Anthony Scalia signalled support for the plaintiffs on the language of the federal law in question, which says that state lawsuits are barred in relation to activity "in connection with the purchase or sale" of a covered security. "There has been no purchase or sale here," he said. A ruling in the case is expected before the term ends in late June. The cases are Chadbourne & Parke LLP v. Troice et al, U.S. Supreme Court. No. 12-79; Willis of Colorado Inc et al v. Troice et al, U.S. Supreme Court, No. 12-86; and Proskauer Rose LLP v. Troice et al, U.S. Supreme Court, No. 12-88. Receiver files 3rd Schedule of Payments to be Made Pursuant to the Interim Distribution Plan - On October 4, 2013, the Receiver filed his 3rd Schedule of distribution payments with the United States District Court for the Northern District of Texas, Dallas Division. The 3rd Schedule will be followed by others, each of which will be submitted by the Receiver on a rolling basis as additional responses to Certification Notices are received and processed. To view a copy of the 3rd. Schedule, please click here. "Generally, if a claimant failed to file a claim with the US receivership prior to the September 1, 2012 bar date, such claims are forever barred as against the US receivership estate, per order of the Court. If there are extenuating circumstances that constitute good cause, the Receivership will consider the circumstances and make a determination whether to recommend acceptance of the late claims by the Court. Given the notice provided, however, we expect that good cause will be a difficult threshold to meet. If claimants wish to submit requests to accept late claims to the receivership, they can use the contact information below. Nonetheless, claimants who filed claims with the Joint Liquidators prior to September 1, 2012 but did not file with the U.S. receivership by that date may be allowed to participate in future receivership distributions if the Receiver determines the claimant has a valid claim and the claimant agrees to jurisdiction of the US Court. We will communicate directly with claimants who filed with the Joint Liquidators before the US receivership bar date with the appropriate form(s) to execute for the purpose of ensuring that such claimants agree to the jurisdiction of the U.S. District Court in Texas. Only after we have done so and received the appropriate forms back from the claimants will notices of determination issue to those claimants. Even if such claimants are allowed to participate in future distributions from the receivership, they will not be eligible to participate in the current distribution that has already been approved by the Court. Stanford Group sold the CDs while claiming that they were backed, at least in part, by SLUSA-covered securities. Therefore, the government's lawyers say, the bogus investments were in fact sold "in connection with" covered securities. And for SLUSA to work, it must be interpreted broadly, and the SEC's views (as the SLUSA watchdog) must be given deference. "Congress intended the phrase 'in connection with' to sweep widely enough to ensure achievement of 'a high standard of business ethics in the securities industry,'" while reining in excessive class actions, the government argues. But Preis says the SEC is backing what Goldstein calls a "newfound interpretation of the securities laws" to broaden its enforcement power "at the expense of backing the Stanford victims." Since the Stanford products that local investors bought were not sold on the New York Stock Exchange, state law should apply, he says. Regardless, it's an intriguing turn in the SEC's complicated role in the Stanford fiasco. Many victims blame the regulators for not catching on to Allen Stanford's scheme early. But the SEC backed investors' controversial bid for relief from the Securities Investor Protection Corp., even though the Stanford International Bank in Antigua, which issued the worthless CDs, was never a SIPC member. 1. How will the Receiver handle payments to beneficiaries of trusts, including trusts formerly administered by Stanford Trust Company, Ltd. in Antigua? Pursuant to the Notices of Determination issued by the Receiver, any payments regarding trusts' accounts will be made to the trusts themselves as payees. However, should the Receiver receive a request to change the payee from a trust to the trust beneficiaries, the Receiver will first need to verify the identities and ownership capacities of all beneficiaries of the trust, which may involve requests for additional information from those individuals, before making the requested change. Please note that any request to change the payee from a trust to its beneficiaries must include the express approval of all such beneficiaries. Requests to have checks reissued, along with supporting documentation, can be submitted to the Receivership within 180 days of the date the check was issued in writing by email at info@stanfordfinancialclaims.com and by mail at Stanford Financial Claims, c/o Gilardi & Co., LLC, P.O. Box 990, Corte Madera, CA 94976-0990. As we also state in the FAQs, people should not include requests for changes to payee names on the certification forms they return, and such requests will not be honored. Most claimants who had similar issues properly raised them as part of the notice of determination objection process, as the payee names are stated in the notices of determination. The only other way to make such a request after the check has issued is in writing per the instructions above. Claimants certainly can contact Gilardi by phone but the actual request for the payee name change and check reissuance must be in writing and signed by all beneficiaries of the trust. I have inquired with Gilardi regarding the answering of phone calls, and they have indicated they are continuing to receive and handle phone calls on a regular basis. Shown here in 2002, former SEC enforcement official Spencer Barasch has been reinstated to practice law before the Security and Exchange Commission, about one year after he was suspended. Government officials say he helped steer investigators the other way when convicted schemer R. Allen Stanford was defrauding investors of $7 billion. The Dallas lawyer accused by the U.S. Department of Justice’s inspector general of single-handedly using his position at the Securities and Exchange Commission to let R. Allen Stanford get away with defrauding investors of $7 billion is free to practice law again before the SEC. Spencer Barasch worked 17 years for the SEC, including seven years as its chief of enforcement at the division office located in Fort Worth. After he resigned in 2005, he began representing Stanford before the SEC. The inspector general’s report concluded that over the years as enforcement chief he had repeatedly denied federal investigators’ pleas to investigate suspicious aspects of Stanford’s offshore investment accounts, which later were determined to have been frauds. Barasch denied wrongdoing at the time. He paid $50,000 to the Department of Justice to settle civil claims alleging impropriety. Stanford was indicted in 2009 and convicted last year. He is serving a 110-year sentence in federal prison. Last year, the SEC suspended Barasch from practicing before the commission, and said he could apply for readmission in one year. Barasch’s attorney released a statement at the time saying that Barasch had accepted the suspension to save on legal bills. Barasch was head of enforcement for the SEC’s Fort Worth office from 1998 to April 2005. After leaving the government, he represented Stanford before the SEC in 2006. In 2005, the report said, an SEC staff attorney presented the agency’s latest findings at a regional meeting of securities law enforcers attended by Barasch. The audit showed growing concern that the alleged Ponzi scheme was growing and putting billions of dollars at risk. During the presentation, Barasch was said to look “annoyed.” Afterward, he reportedly told the attorney he had “no interest” in bringing action against Stanford. Some former colleagues defended him, however, with one telling The News that, at worst, he had used bad judgment.